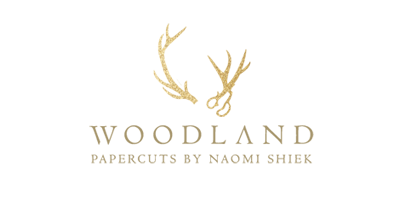 For years I created my papercuts for clients and didn't know how to name my style. It wasn't traditionally Jewish, or Chinese, or Polish, or graphic, nor strictly Minimalist or loosely Victorian. That is, until I had a client in 2014 who wanted all Jewish elements - with a spin! We're talking peace doves, and Jerusalem, and Sabbath Candles, and the Kiddish Cup, etc... (SEE NOUVEAU JUDAICA). It came out so well in fact it became one of my favorite designs, a point of pride for me to define what JUDAICA NOUVEAU means to me (and if you're wondering about the word-wsitchoroo, I don't know French well enough so I'm just winging it.) And this design is loved not only by me - but by other couples getting married who fell in love with the imagery and the style and kindly asked me to create new versions for them! Michele & Neal contacted me in May asking for a square version of the Nouveau Judaica design, with some different elements unique to them. 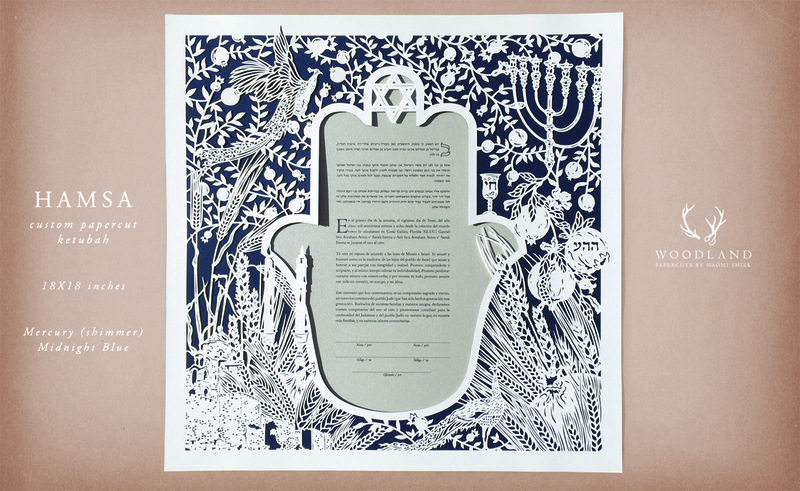 They were getting married later in the year in September but wanted ample time to design, make, and deliver their ketubah. Ordering the ketubah in advance is always best as it makes so there's one less thing to stress about in the last-minute rush of preparations. With this order, once we fleshed out all the details they envisioned for their ketubah they reserved my first available start date, which was a little over 2 months away (another reason why you should order your ketubah early in the wedding preparations). I worked on their text choice, added in their initials, changed the architecture, and even hid a small heart in there (did you spot it?). From design to shipping the whole process took 3 weeks. 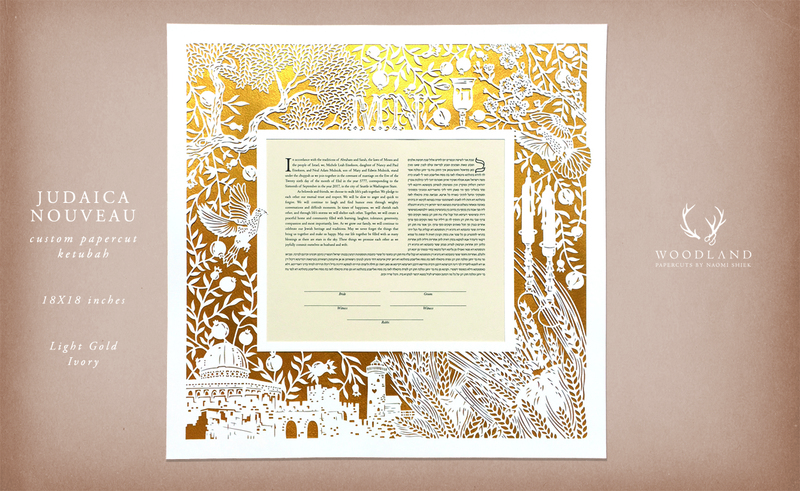 Just as I was finishing up Michele & Neal's order, Ivan & Andrés contacted me to create a ketubah full of Jewish symbolism for their wedding in January of 2018. They had a very clear vision of what they wanted and were so organized, it was a pleasure to work with them! Together we worked on expanding the Judaica Nouveau design to include elements that were personal and meaningful to them. It was important to Ivan & Andrés that while abundant in details the design should remain 'simple' so each symbol would be clear. They were worried they were asking for a lot, but I was just champing at the bit for the chance to rework the original. We added more details and symbols into their design, including royal peacocks and this awesome Hamsa frame for their text - piling good luck on top of good luck - and the result is a beautifully detailed Jewish artwork that celebrates their heritage and memorializes their union with good fortune and love. From the first moment we connected over email, Naomi was so professional and helpful. 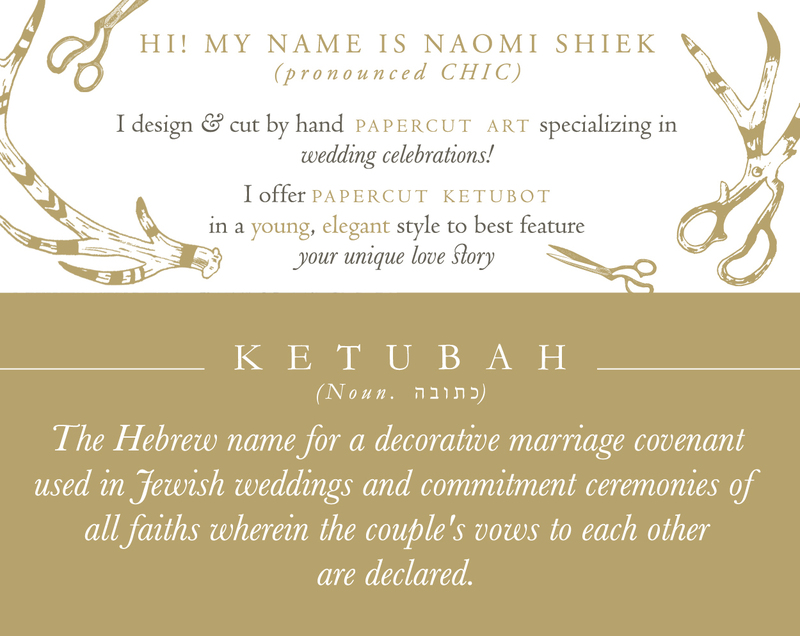 She took a rather long lists of ideas we wanted to incorporate into our ketubah and she produced something that exceeded our expectations.